DIRECT FROM LOURDES - Our Lady of Lourdes & Bernadette Bless this House 2019 Calendar. Our Lady of Lourdes & Bernadette Bless this House 2019 Calendar. 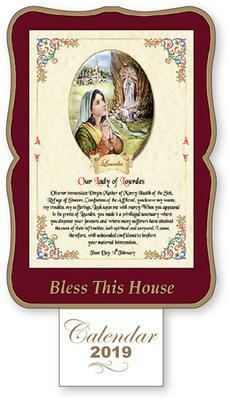 Our Lady of Lourdes & Bernadette bless this house 2019 calendar with prayer. Size 14" x 7" with liturgical date tab & gold foil highlights.